Fortunately, iron deficiency anemia isn't as big a problem as it once was. The use of vitamins, iron-rich baby foods, and/or iron-fortified baby foods have helped both breastfeeding babies and babies who drink an iron-fortified infant formula avoid becoming anemic from a lack of iron. Iron deficiency is still a problem for some kids, though, especially toddlers who are picky eaters and drink too much milk and not enough iron-rich foods. In general, your child should eat at least two or more iron-rich foods each day. Knowing which foods actually have iron in them can be confusing for parents, though. Seafood, such as oysters, clams, tuna, salmon, and shrimp, etc. At first, unless your baby was premature or is already anemic, your baby will usually get all of the iron she needs from breast milk or iron-fortified infant formula. Once she is 4 to 6 months old, though, she will likely begin to need some extra iron, which usually comes in the form of iron-fortified baby cereal. Later on, be sure to choose from a good variety of iron-rich baby foods, which you can often find by comparing food labels and choosing foods with high iron content. Or choose age-appropriate iron-rich foods when making your own baby food to make sure your infant gets enough iron. In addition to foods that naturally have a lot of iron in them, many foods are now fortified with iron or have iron added to them. This is good news because many kids, especially younger ones don't usually like many of the best iron rich foods, such as liver, oysters, clams, and lentils. Remember that food that provides 10% to 19% DV or more for a nutrient, such as iron, is usually considered to be a good source of that nutrient, so compare food labels and look for foods that have higher numbers for iron on the food label. Risk factors for iron deficiency include toddlers and older children who drink too much milk each day and have a diet low in iron and vitamin C.
Vitamin C can help your body absorb iron, so it is a good idea to pair iron-rich foods with foods that have a lot of vitamin C, including citrus fruits and iron-fortified orange juice. It is harder for the body to absorb the nonheme iron that is found in fruits, vegetables, and grains, than the heme iron that is found in animal foods, including red meats, poultry, and fish. Remember that nuts can pose a choking hazard for younger kids and too much seafood can expose younger kids to mercury, so follow current fish and mercury warnings when feeding children seafood. Keep in mind that the %DV for iron on food labels is based on the adult needs of 18mg or iron a day, while a toddler only needs about 7 to 10mg a day. So while an egg provides 4% DV of iron for an adult, it would actually provide about 7% to 10% DV of iron for a toddler. 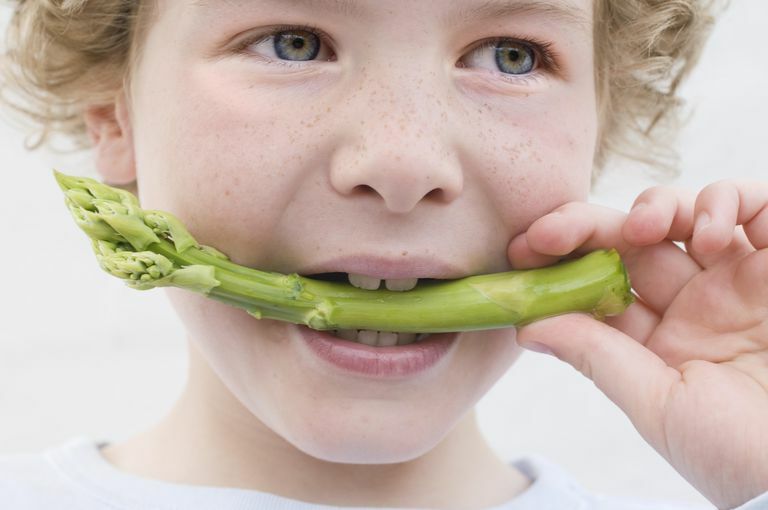 Are your kids getting enough iron-rich foods? American Academy of Pediatrics Clinical Report. Diagnosis and Prevention of Iron Deficiency and Iron-Deficiency Anemia in Infants and Young Children (0-3 Years of Age). Pediatrics 2010; 126: 1040-1050. NIH Dietary Supplement Fact Sheet: Iron.